Take a trip down the legendary Rhine River from Cologne, stopping in the famous and picturesque cities of Koblenz, Speyer, Strasbourg and more on your way to Basel, Switzerland. Enjoy the serene flow of the river, luxury accommodations and a free beverage package. A river cruise along the Danube, the Seine or the Douro Rivers through the lush valleys of Europe has long been the epitome of a luxury vacation. River cruise boats - with their long, low profile - glide through the towns of Germany, France, Austria and the Netherlands, their guests sipping wine on spacious balconies. What was once priced only for the very rich has now become affordable for travelers of all backgrounds, ages and incomes. The Danube River is Europe's second-longest river after the Volga, and the most popular river for cruising. It originates in the Black Forest of Germany and flows through ten countries, including Hungary, Austria, Croatia and Romania. Its banks are lined with castles and fortresses, testimony to its role as the boundary between ancient empires. 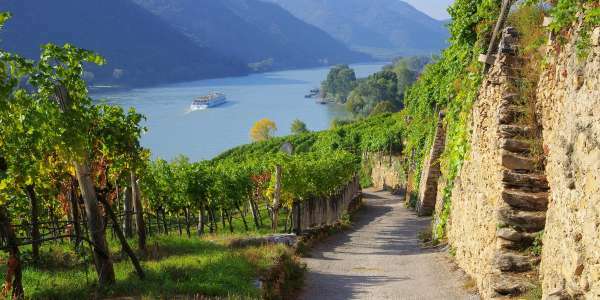 A river cruise on the Danube might embark in Passau, Germany and float past the cities of Vienna, Bratislava and Linz to a debarkation point in Budapest, Hungary. Other itineraries on the Eastern Danube might take you all the way to the Black Sea. Also offering a variety of river cruises, the countryside of France has many rivers that wind through the vineyards of Burgundy and the wine-producing region of Bordeaux. You can cruise the Loire, Rhone and Saone valleys for lovely, quaint villages, castles and spectacular scenery. Perhaps the most famous river in France is the Seine, which flows from the Atlantic to the city of Paris. French canals offer cruise experiences, too, with some barge and bike vacations that allow you to bike through some areas and join the barge each evening for gourmet dining and luxury accommodation. You don't have to stick to European destinations to enjoy a river cruise. In North America, the Ohio, Missouri and Mississippi Rivers have a long tradition of riverboats such as the great stern wheelers of Mark Twain's era. Riverboats still travel up and down the American rivers, providing luxury experiences that take cruisers to the great cities of St. Louis, Nashville and New Orleans. It's a special experience around the winter holidays, when the cities decorate and celebrate along the riverfront in grand style. Another popular area for river cruises is southeast Asia. A Mekong River cruise past lush jungles and ancient temples appeals to adventurous travelers with a taste for the exotic. The Mekong flows through China, Myanmar, Laos, Thailand and Cambodia before forming Vietnam’s Mekong Delta. Along the banks of the Delta, you'll see rice paddies, orchards, fisheries and floating villages that depend on the river. A cruise through this area of the world offers the scenery of palaces, pagodas and lush fields along with a chance to taste the delicious, distinctive cuisine of the region.